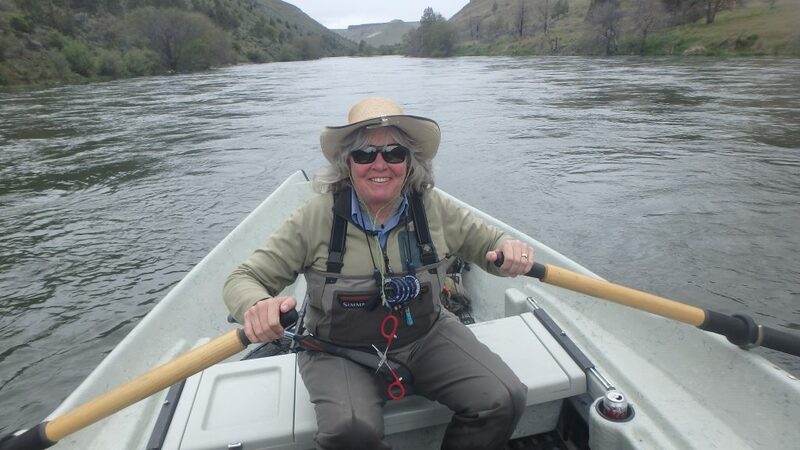 Dave and I recently treated ourselves to a guided day on the Williamson River and the Wood River in Southern Oregon. The best part of the day was just remembering what it is like to have someone else take care of all the fishing details! Yes I got to sit in the front of the boat and just fish! I did tie on my own flies! 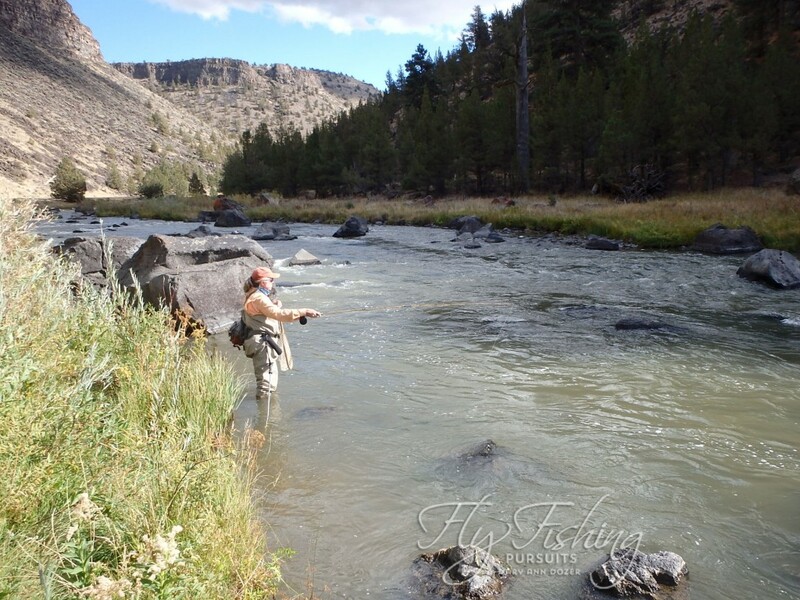 However, nothing is more relaxing and intriguing than fishing new waters under the guidance of a guide. Great day! 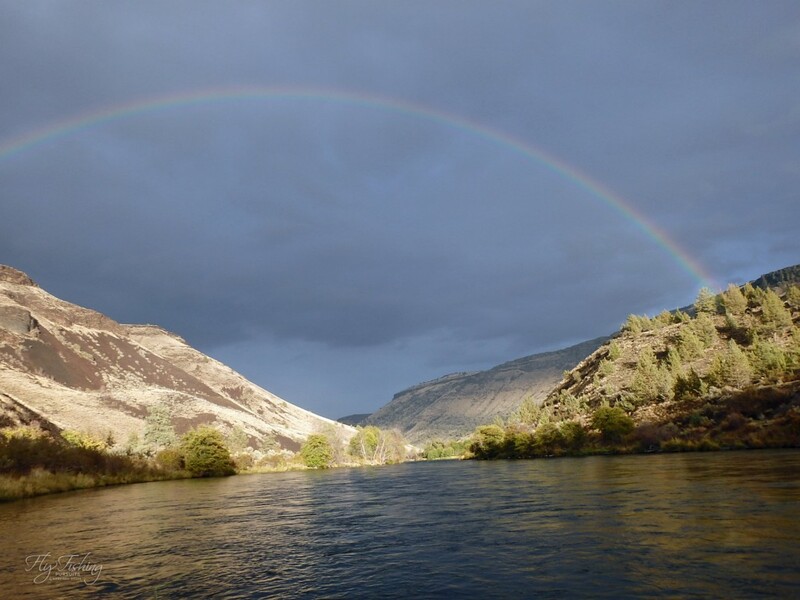 Mother Nature always plays a role in fishing pursuits. 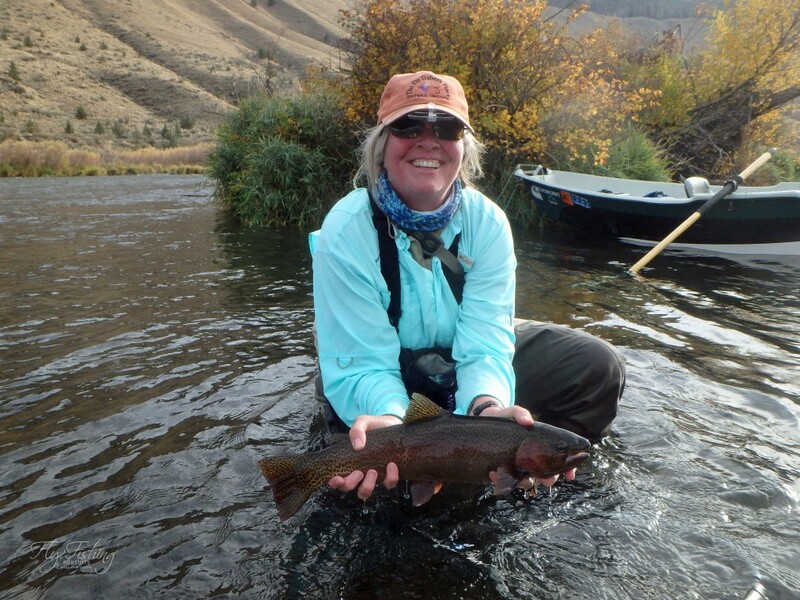 Sometimes she provides a stellar day where the fishing is easy and awesome. Other days she decides to make the day a bit more challenging. In our case rains a few days before increased the river levels and turbidity! 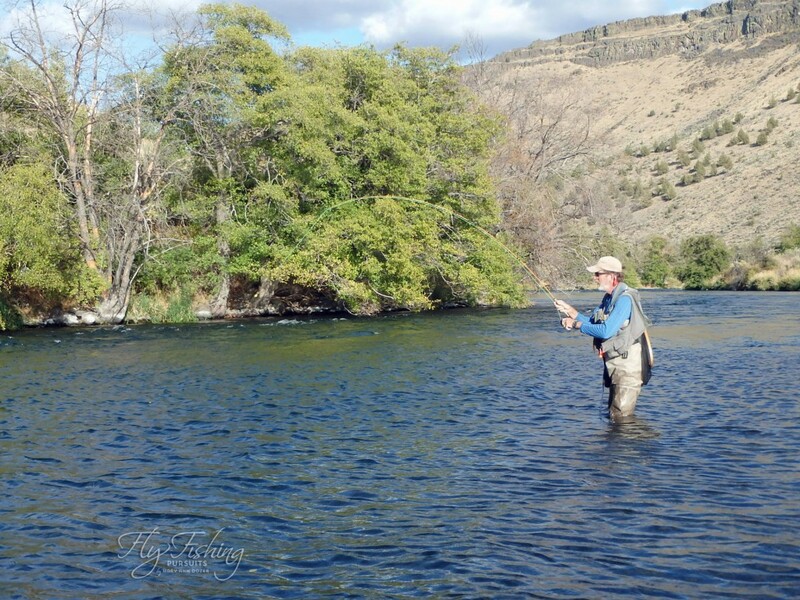 Thus we didn’t hook and land any Williamson River fish, but as we floated we scared up a few and my goodness I am headed back there this fall. 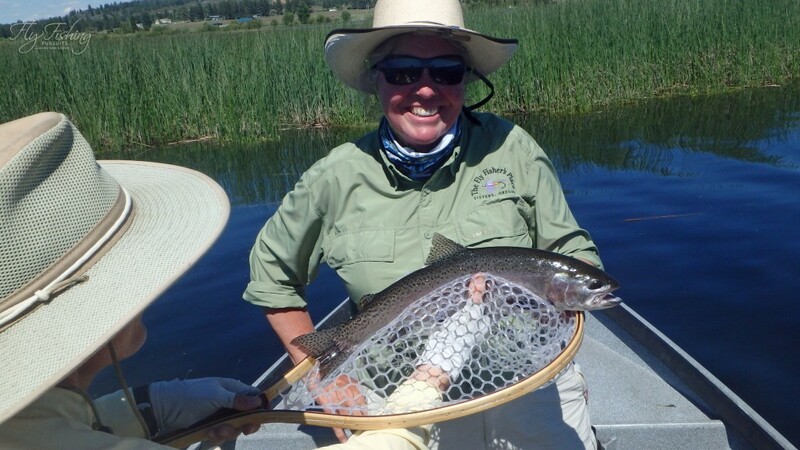 Some awesomely huge fish on this river. 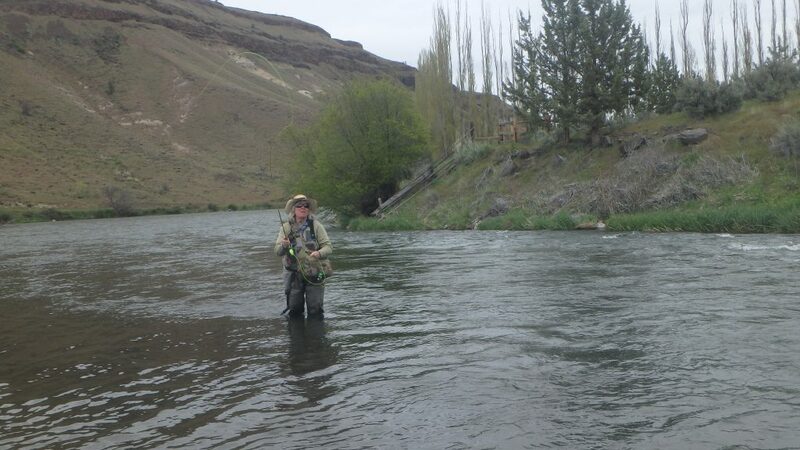 On the Wood River conditions were a bit better and I was able to land some nice Wood River Fish. Regardless of what type of fishing conditions Mother Nature deals you! 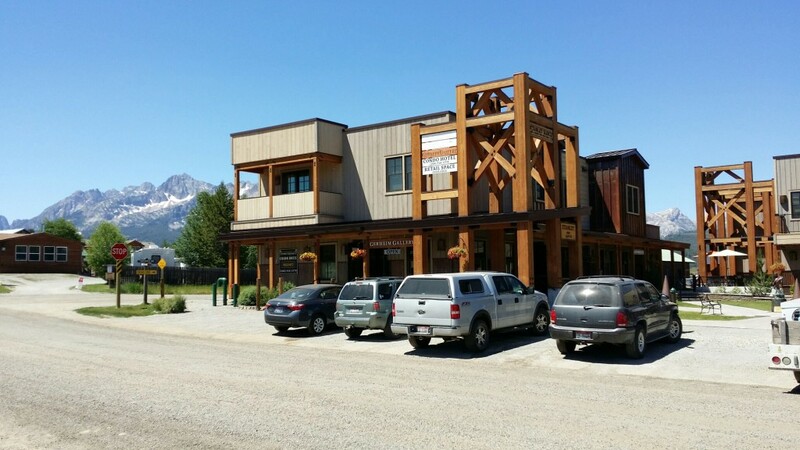 She always deals you some great scenery! Sorry I don’t have more photos! I was busy fishing. 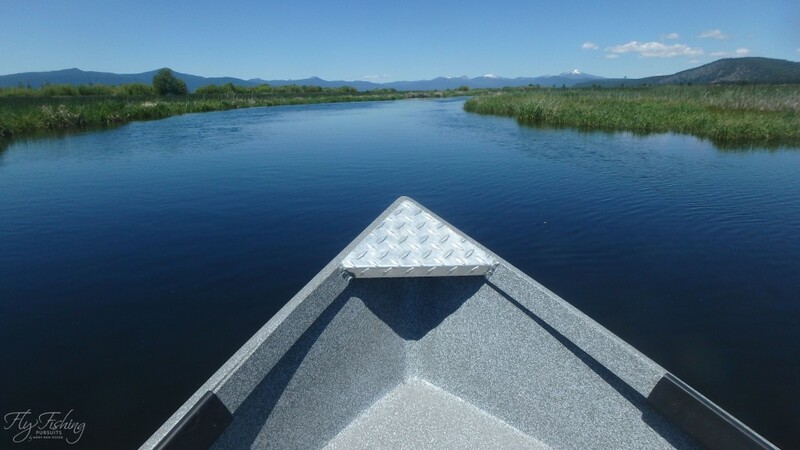 My view from the front of the boat! 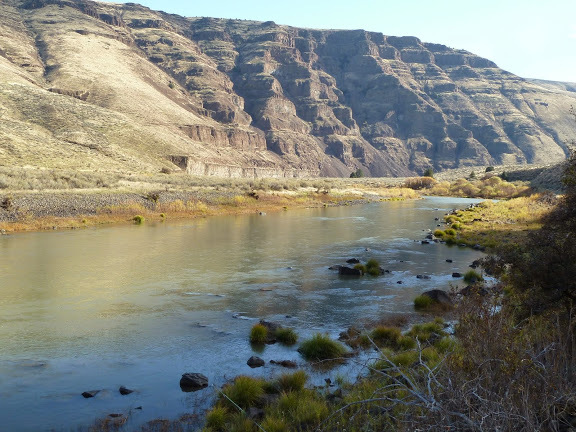 This fall I discovered the John Day River. 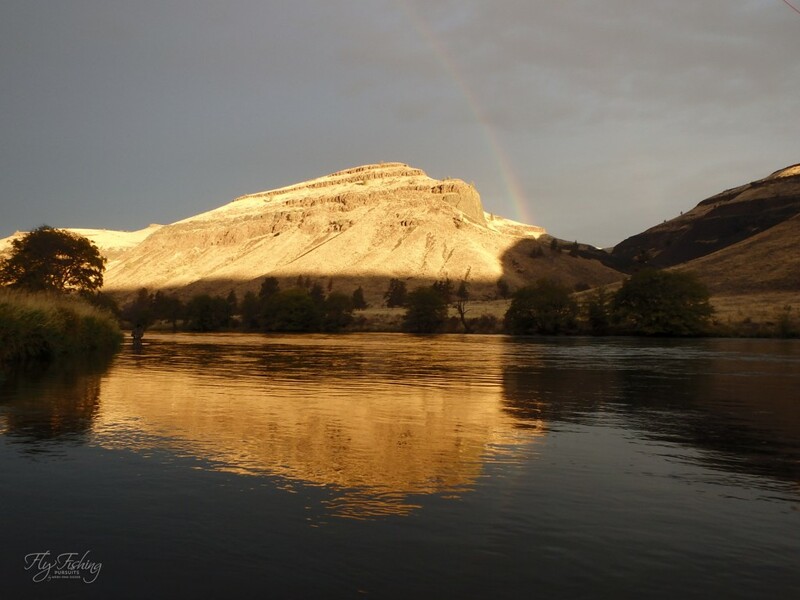 Not only do you have stunning views of the canyon, brilliant fall colors – but water with a diversity of structure to explore This is a spot off the beaten path that is worth an exploration. 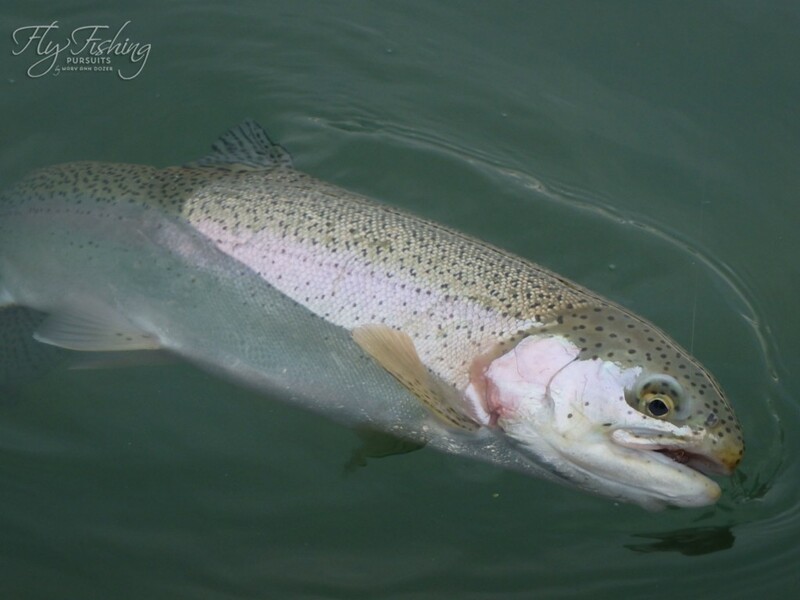 I just hope that when you go it isn’t as windy as it was for me – however I persevered against the wind and totally enjoyed my time swinging for steelhead. 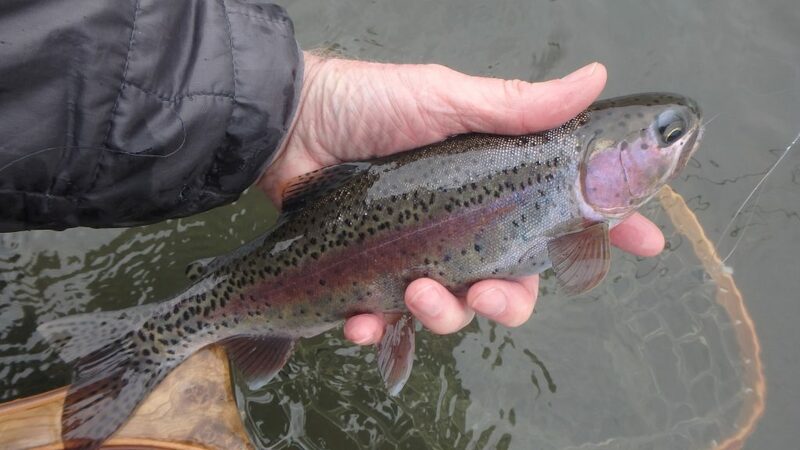 Even though this was my first trip out I was lucky enough to hook and play a nice sized steelhead but after the third run – good ole “steellie” out smarted me and threw the hook. Thanks to Sue S for the great photos! 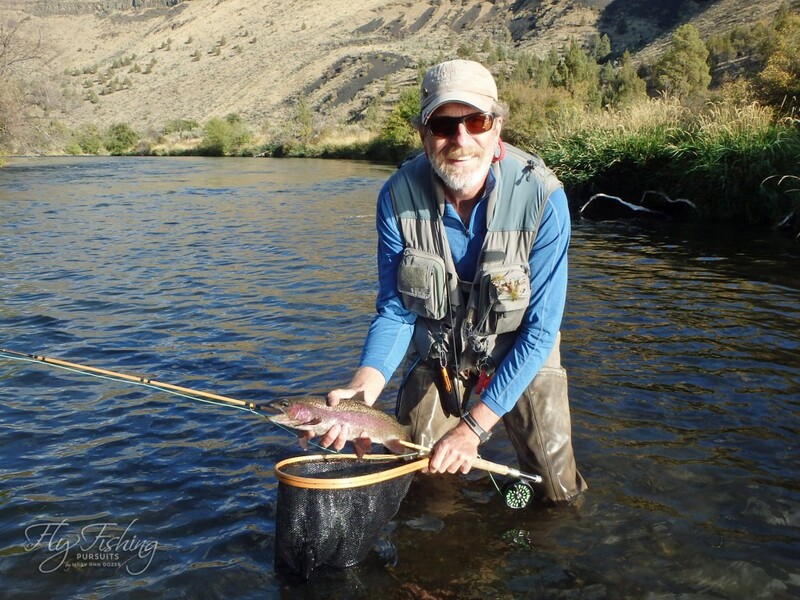 Well – it was fun to play this steelhead – but it won the game and threw the hook. 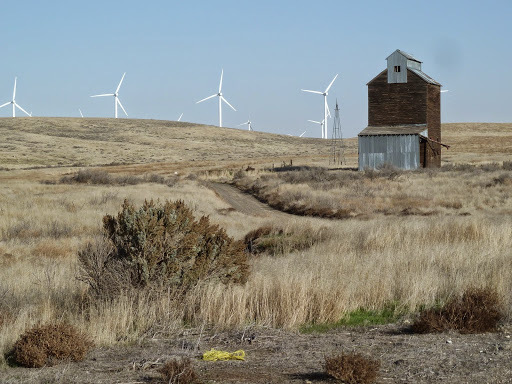 The local scenery is loaded with wind turbines – very cool. 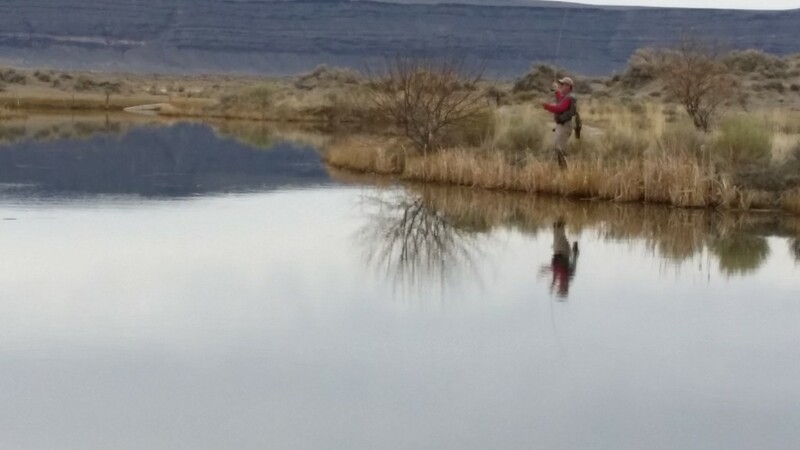 Our early November weather allowed me to get out and fish multiple times! 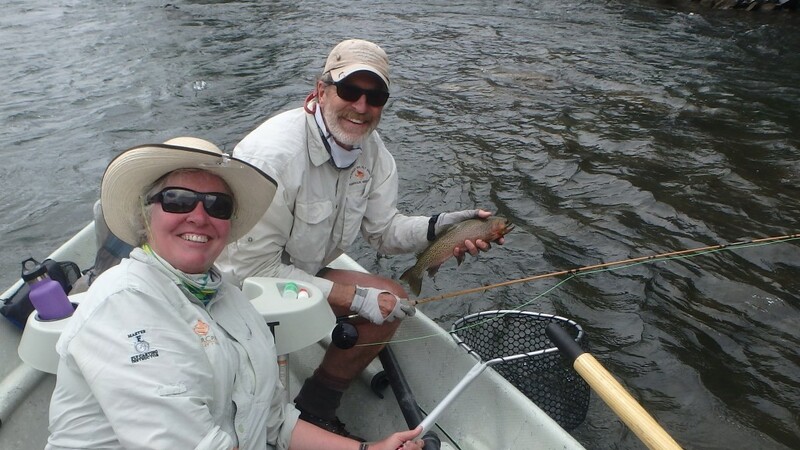 Fishing success varied from day to day – however Dave and I hit the jackpot one day early on in our float. 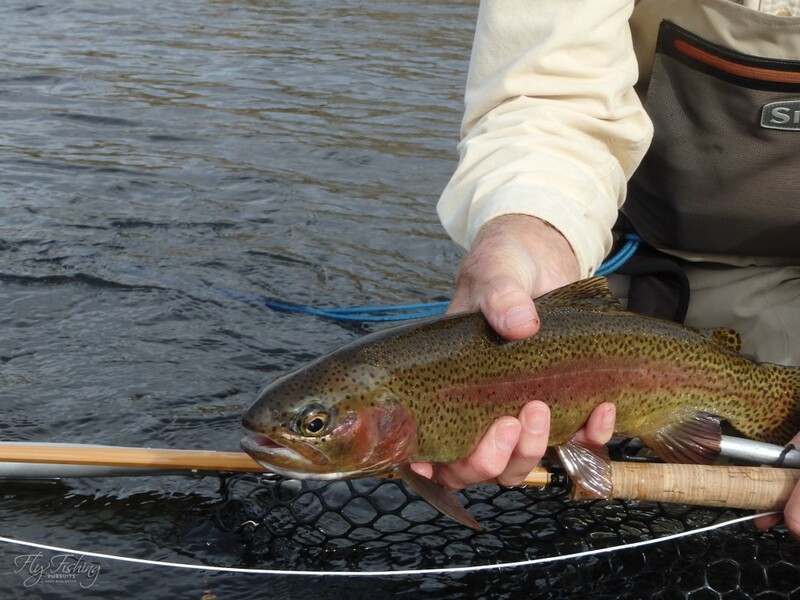 Each of us caught multiple rainbows and both landed a nice 20″ plus Deschutes Redside. 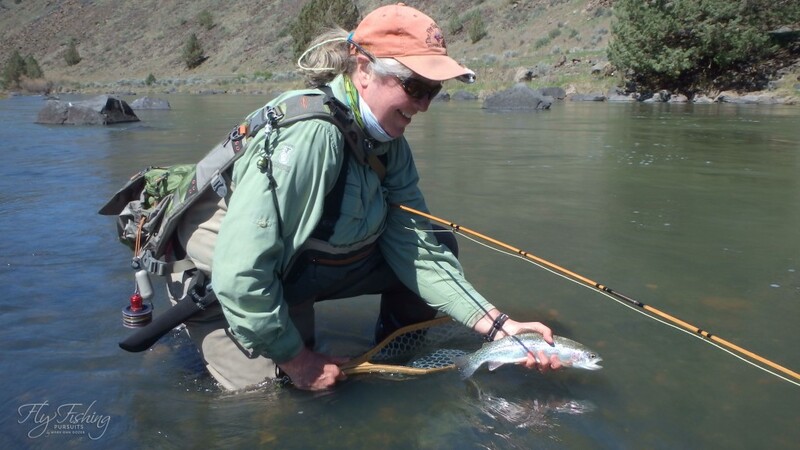 These rainbows are a blast to play and with the Deschutes current – you can to keep you eye on the game or otherwise the rainbows take a jump as they throw you fly. 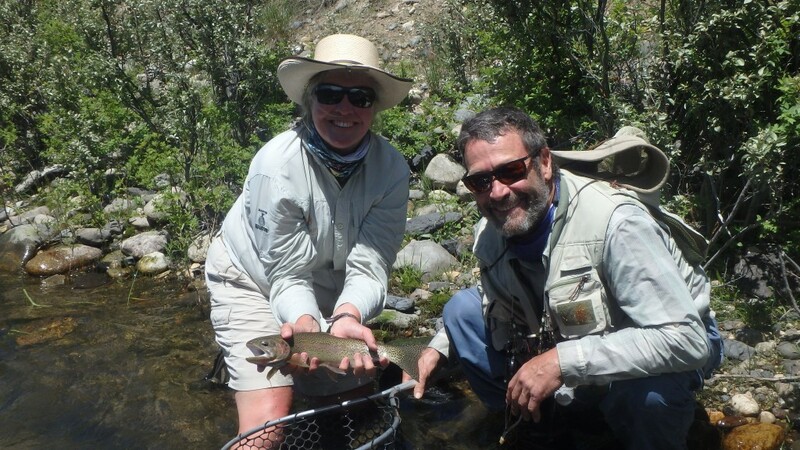 However – today was one of those days when Dave and I both beat the odds and landed some nice fish. Enjoy! 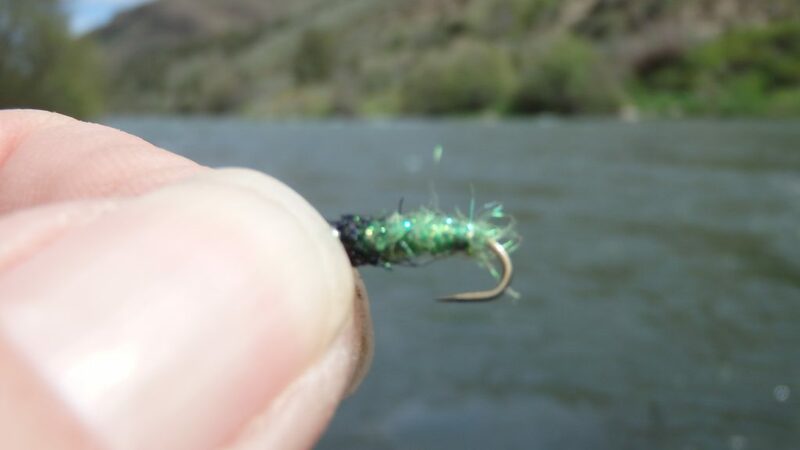 A close up of a good sized Deschutes River Redside. No complaints from me. 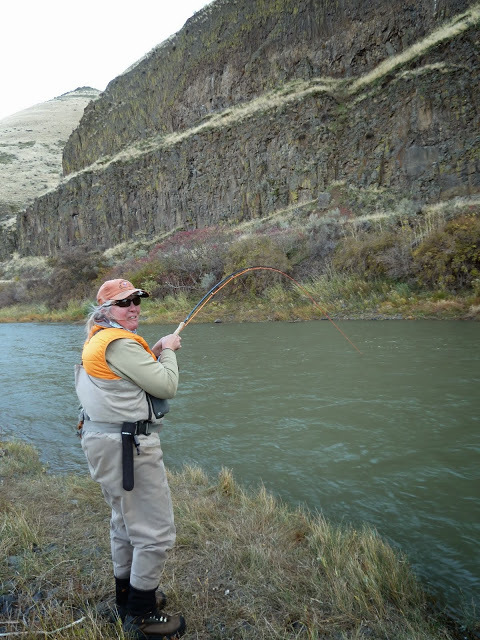 Dave and I recently made a move to Central Oregon – allowing us to pursue trout multiple days of the week and in the fall for me to pursue that elusive steelhead. 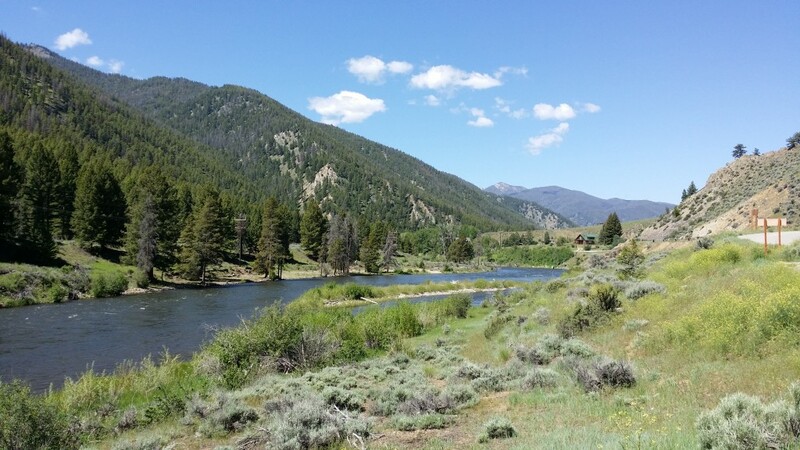 Good news or bad news between fishing and unpacking I haven’t done many posts – until today. 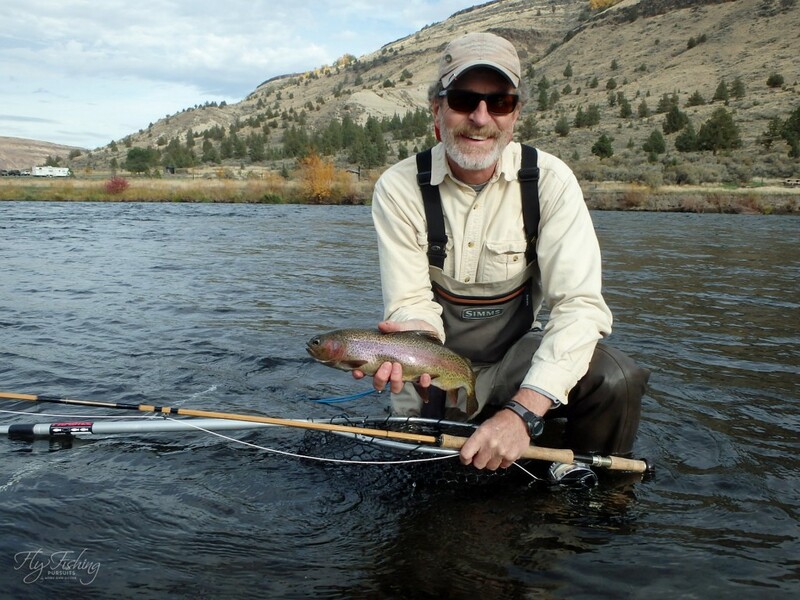 I have spent my days on the water on either the Crooked or the Deschutes. As you will see with the photos these are two distinctly different fisheries. To contrast simply on flows and water depth. The Crooked the fall cfs is in the mid 70’s and you can pretty much cross back and forth across the Crooked at most spots. 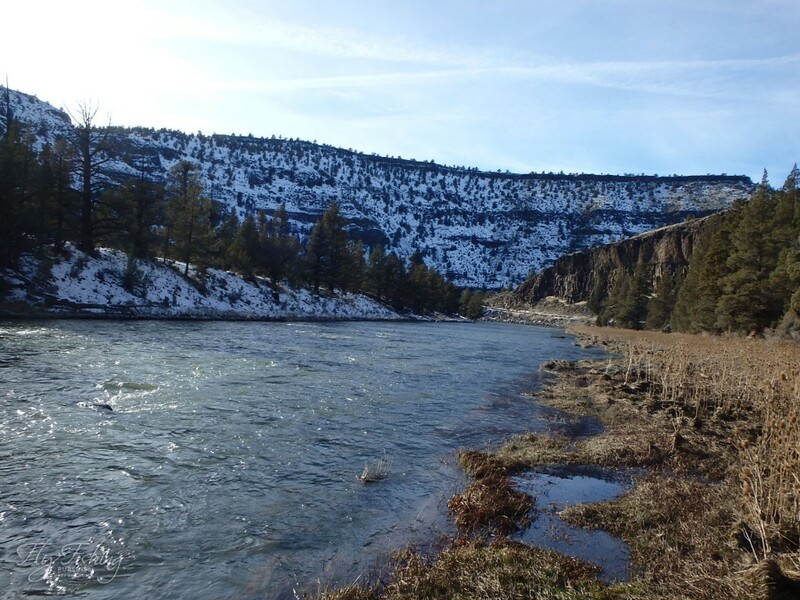 Whereas the Deschutes we’re talking more like mid to high 4000’s on cfs and you typically can’t wade more than 5 to 10 feet into the river. 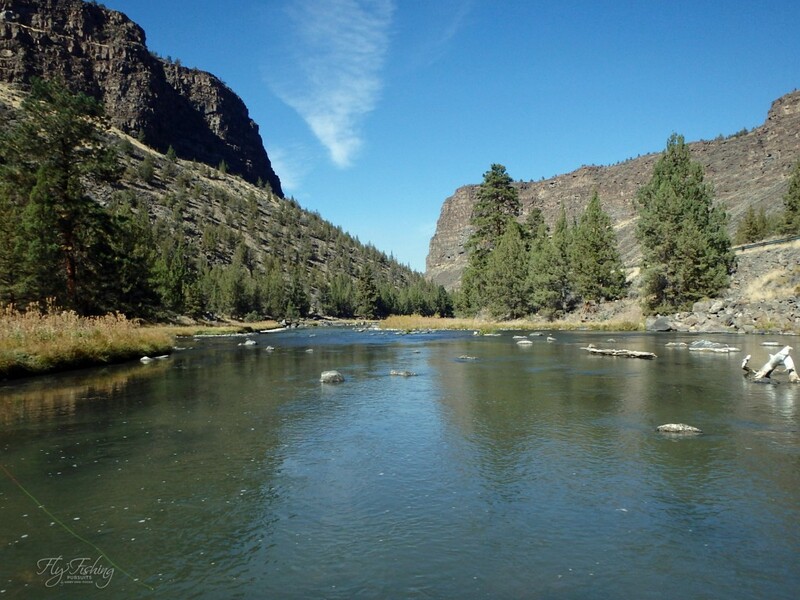 The Crooked River has murky water and lots of visible structure – great for new and skilled anglers. 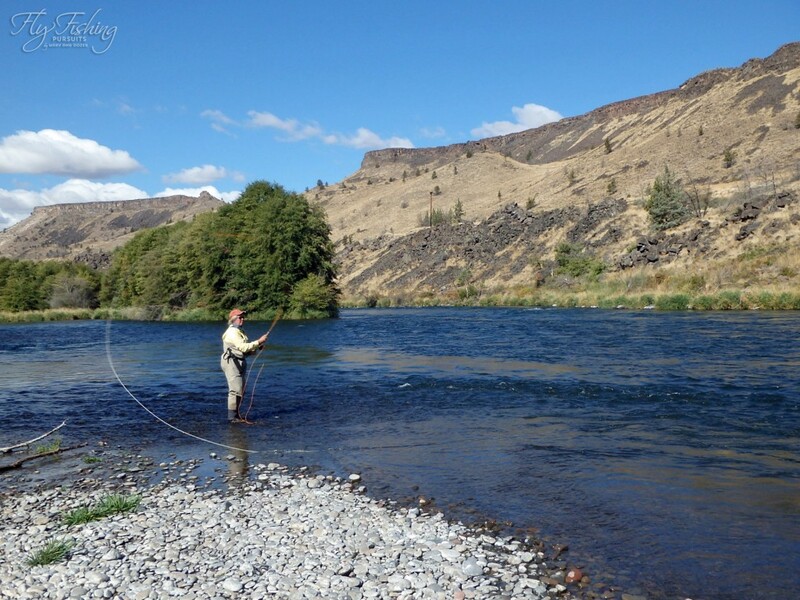 The Crooked River is loaded with fish always willing to show themselves and take a fly on the surface or sub-surface. 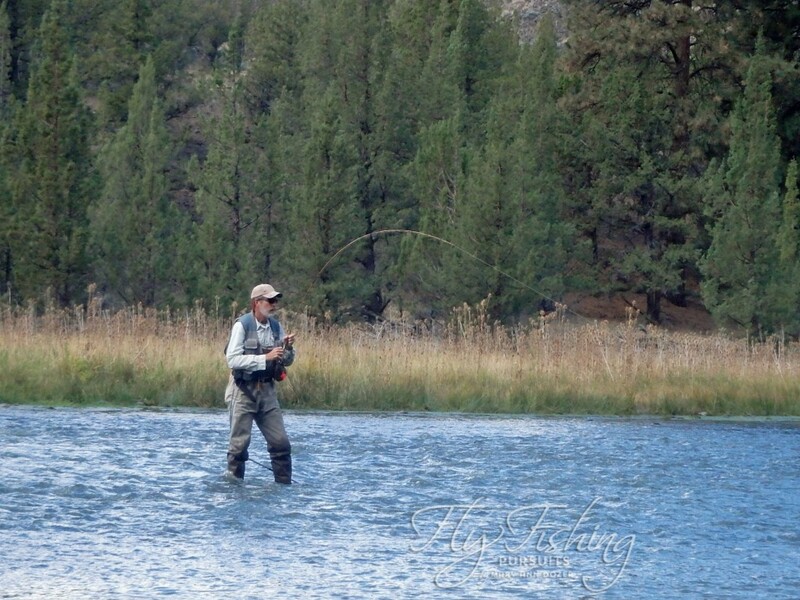 The Deschutes is a large river with clear flowing water, the structure (feeding lies) for fish not as obvious and in the fall the fish rarely give their location. 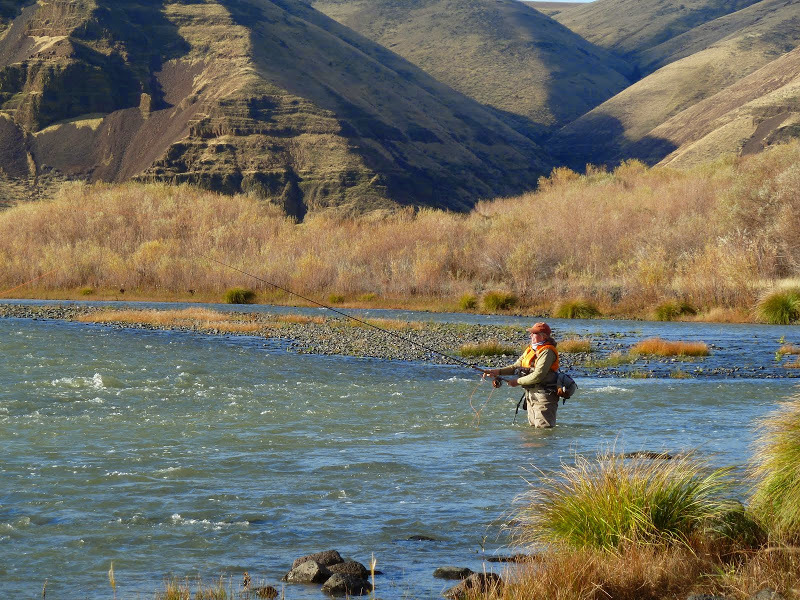 The essence of Deschutes Canyon is a must for new and skilled anglers. 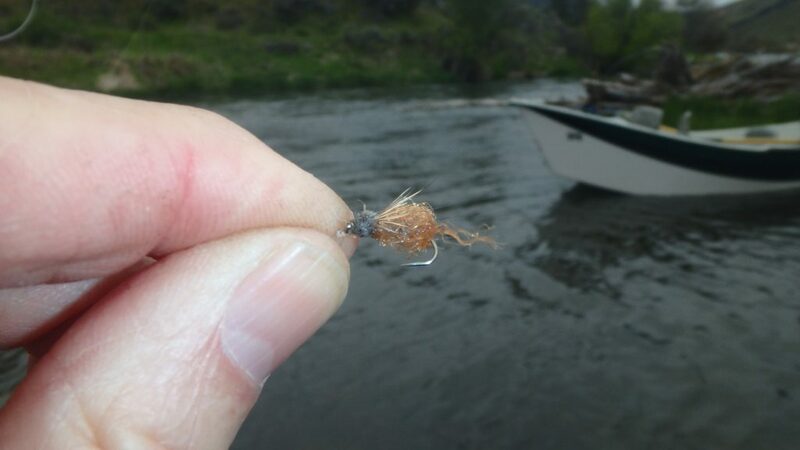 However, the number of fish taken on a fly is smaller. 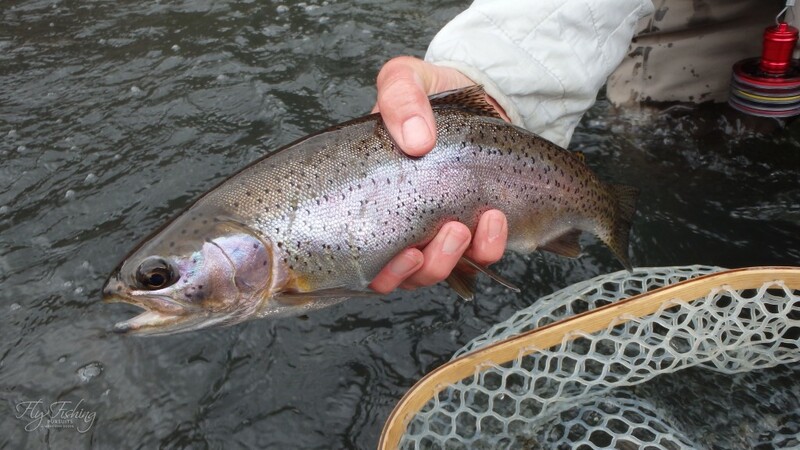 But when a trout takes you fly it is a strong trout and with the current always a fun game regardless of the fish size. 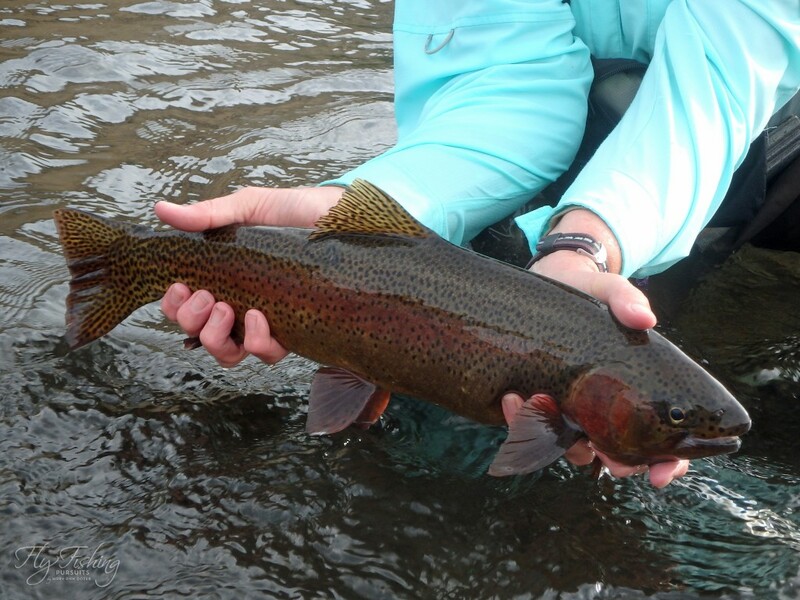 A photo album of this falls photos will show the spectacular scenery and fish that will treat any angler. 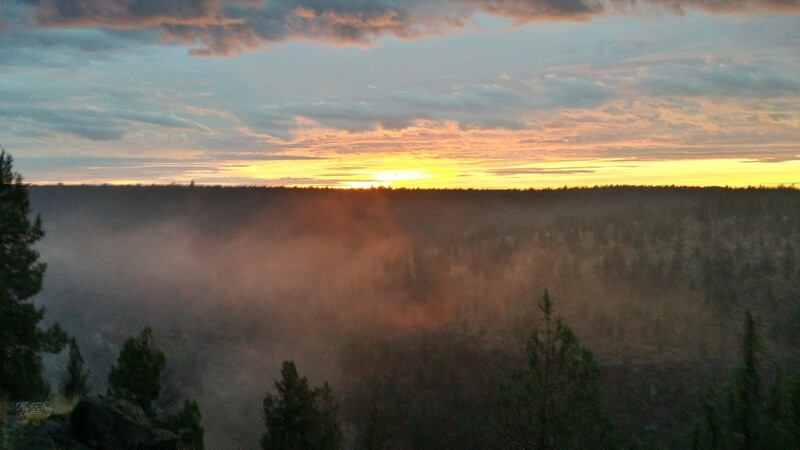 One of the many sunrises I saw as I prepared for my days of fishing. 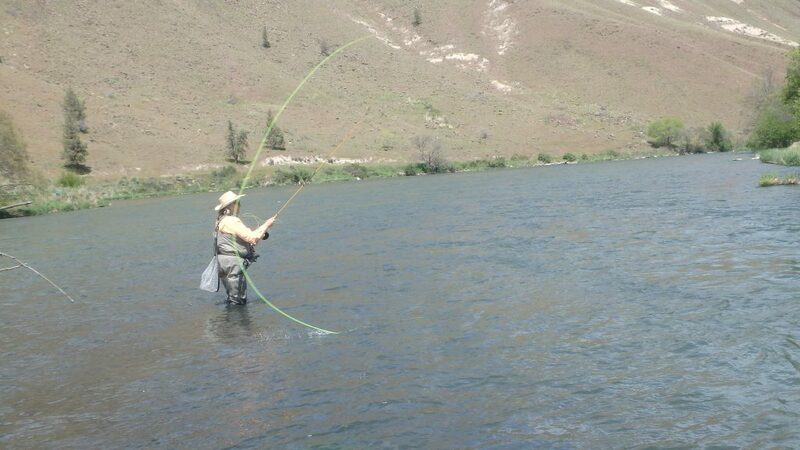 Dave fighting a fish on his bamboo rod. 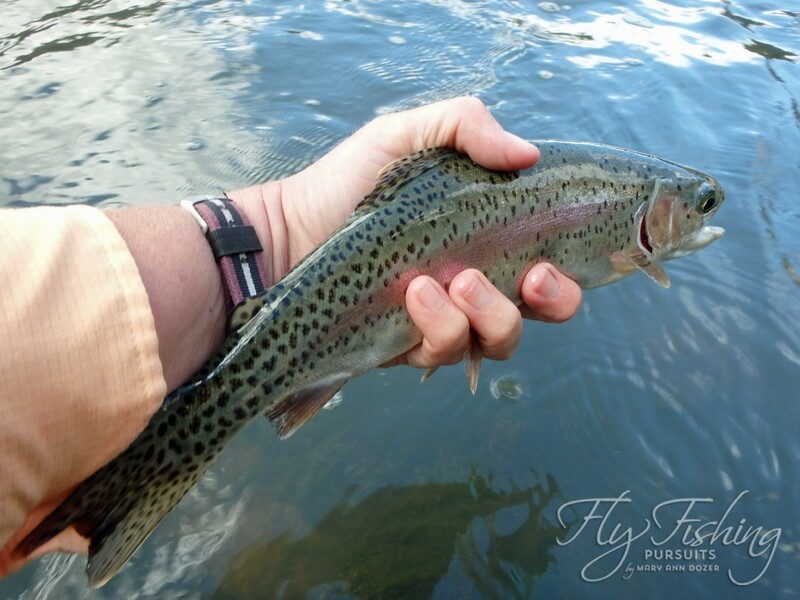 Don’t let the murky water deter you – plenty of fish that take flies. 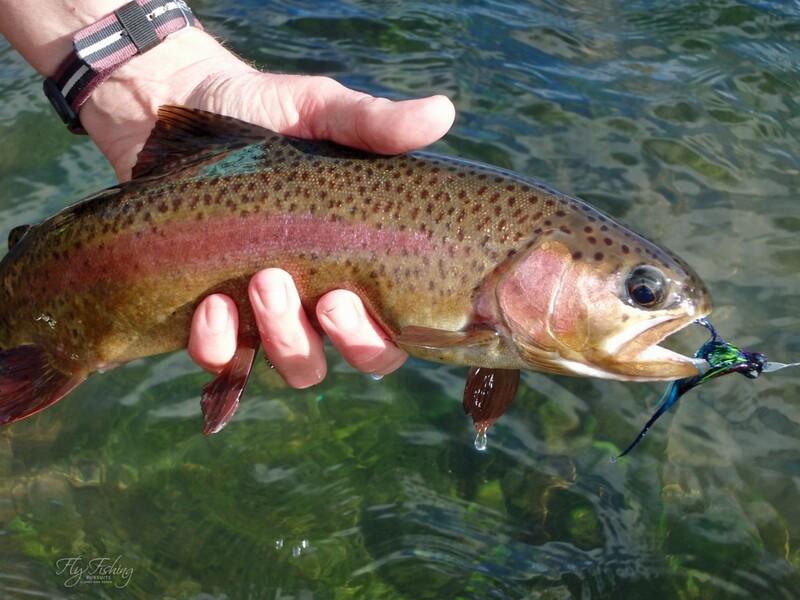 Early morning sun and showers enticed a rainbow – just not the kind that take a fly. 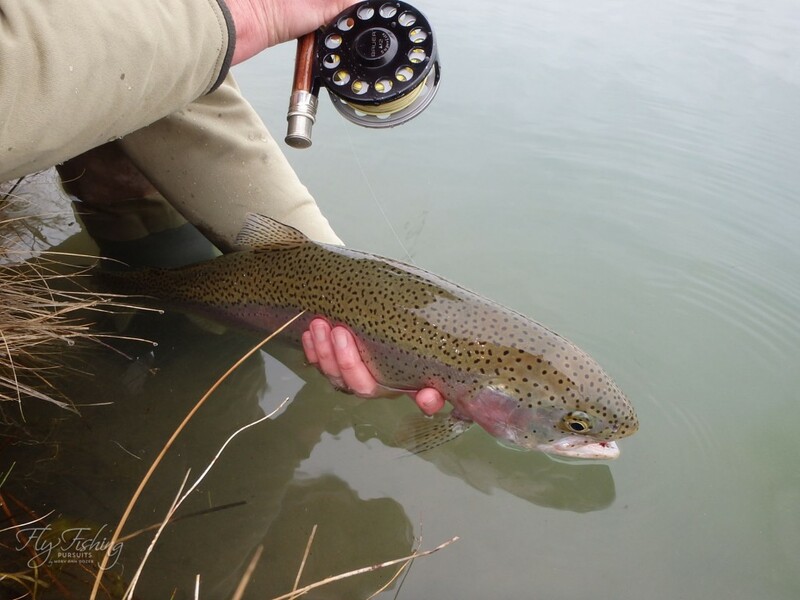 Now a steelhead – but a nice rainbow on the swing. Today – was another one of those rare snow days in Corvallis. A great time to work on the project list. 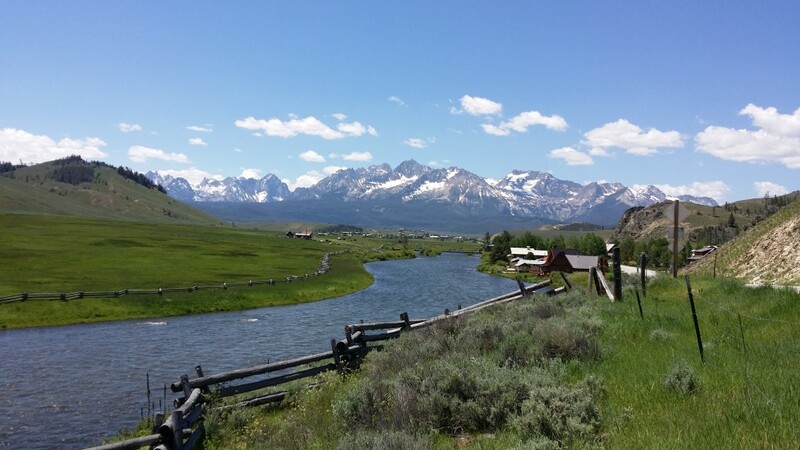 Given that I am tired of a “poor & cold” winter fishing season, I decided to edit a video from fishing this May at Yamsi Ranch. The closest I could come to fishing in warm sunny weather. 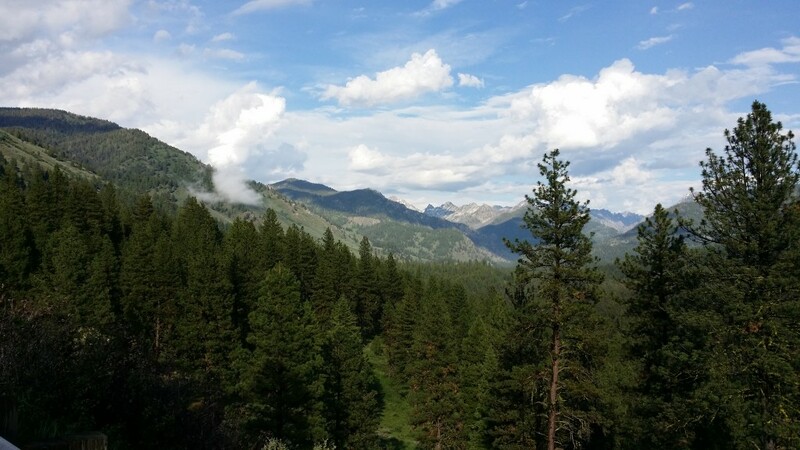 No fancy music – just the vista’s and sounds that mother nature provides. 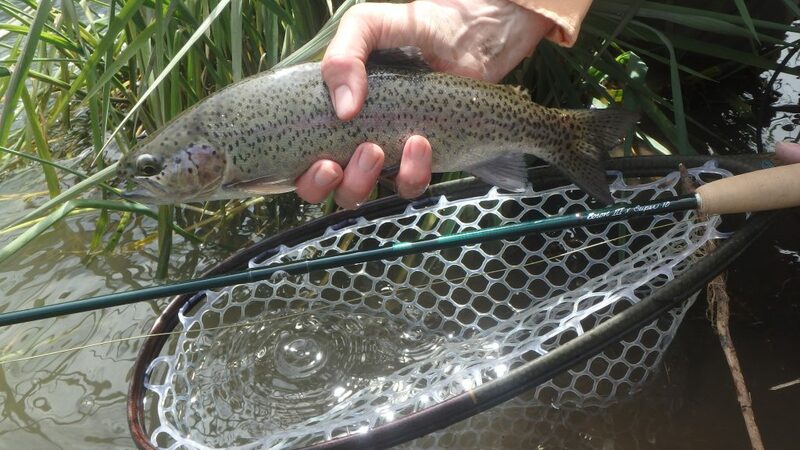 So enjoy watching me hook, play, and land a nice rainbow on a 7’6″ 5 wt bamboo rod.